Extruded clear acrylic with gold mirror film on the front side. The back consists of the actual mirror effect’s backside and will therefore have a grey appearance. Acrylic is often used for signage, jewellery, windows, screens, lids, furniture and aquariums. Our acrylic sheets generally have a protective film on both sides to help prevent burn marks. If the sheet is only to be laser cut, we leave the film on. If the sheet is to be raster engraved, the film is removed from the side that is to be engraved. 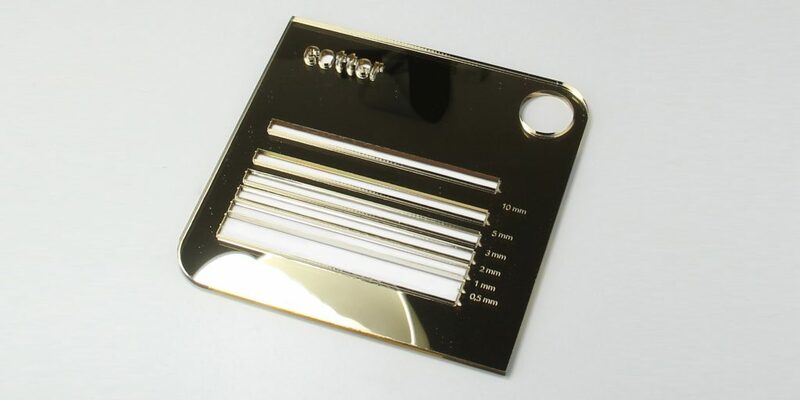 Raster engraving of acrylic produces a matte, white surface, as the laser etches very dense lines in the material. The contrast is most visible in cast acrylic. A thin line of about 0.2 mm is drawn when vector engraving. Usually etched from the back, so when the mirror film is removed, it achieves a nice effect. 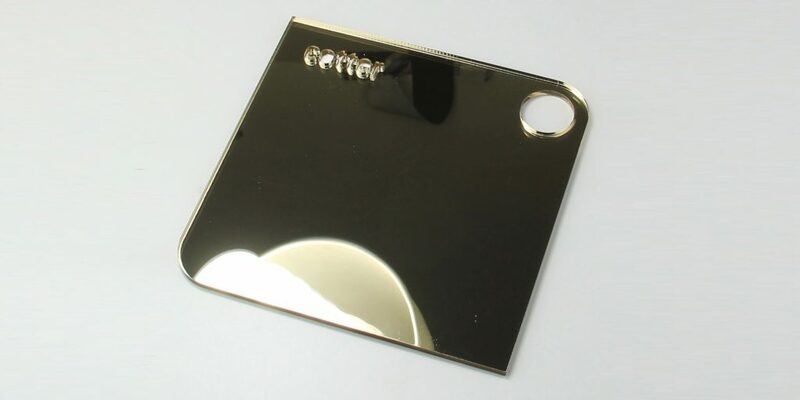 Also available with mirror surface in silver instead of gold. Top – No burn marks. In general, a protective film is applied that should be removed after you have received your cutting. Has a clean, sharp appearance. When raster engraving, the film should be removed before cutting. The cutting process will create a matt, white deposition of smoke close to the cutting edge. Edges – No burn marks. Have a sharp appearance and are in the same colour as the actual material. 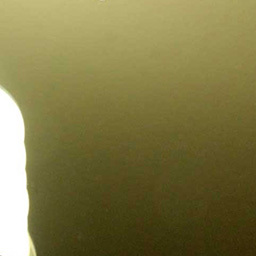 Bottom – No burn marks. Has a clean, sharp appearance. In general, a protective film is applied that should be removed after you have received your cutting.